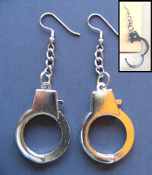 Huge Funky Punk HANDCUFFS EARRINGS - Wedding Gag Gift, Silver Chrome-plated Metal HANDCUFF Costume jewelry charms. Approx. 1-inch (2.5cm) wide x 2-1/4-inch (5.63cm) long. Wear the pair, or split with a fetish friend! Unique Gift for LAW ENFORCEMENT, POLICE OFFICER, GOTHIC, COP, BIKER, EMO, ROCKER !